Wearable prints are not only a decorative art form but also the product of a range of complex industrial processes and an eco- nomically important commodity. 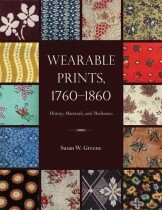 But when did textile printing originate, and how can we identify the fabrics, inks, dyes, and printing processes used on surviving historical examples? 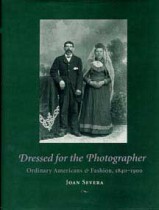 In Dressed for the Photographer, Joan Severa gives a visual analysis of the dress of middle-class Americans from the mid-to-late 19th century. Using images and writings, she shows how even economically disadvantaged Americans could wear styles within a year or so of current fashion. This desire for fashion equality demonstrates that the possession of culture was more important than wealth or position in the community. Arranging the photographs by decades, Severa examines the material culture, expectations, and socioeconomic conditions that affected the clothing choices depicted. Her depth of knowledge regarding apparel allows her to date the images with a high degree of accuracy and to point out significant details that would elude most observers. 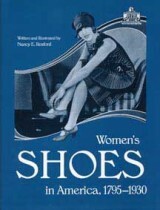 In an engaging narrative history, the beautifully illustrated Women’s Shoes in America investigates an aspect of American material culture not previously examined and provides a detailed reference for dating women’s footwear. Part One, “A History of Women’s Footwear in America,” discusses the history of the American shoe industry and surveys changing styles of shoes, boots, boudoir slippers, overshoes, and sports shoes. Part Two, “Dating Women’s Shoes, 1795-1930,” a detailed reference for dating surviving shoes, will be of particular use to museums, dealers, collectors, material culture historians, and reenactors. Over four hundred clear and detailed drawings make identification as simple and accurate as possible. During the latter half of the nineteenth and the first decade of the twentieth centuries, books, periodicals, and newspapers were rich in discussions related to women’s roles, health, beauty, and dress. Many believed that restrictive and unwieldy women’s fashions compromised health, distorted women’s true physical beauty, and curtailed the potential role of women in society. 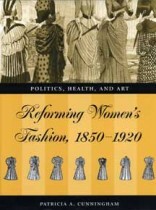 Reforming Women’s Fashion, 1850–1920 focuses on the efforts toward reforming women’s dress that took place in Europe and America during this period and the types of garments adopted by women to overcome the challenges posed by fashionable dress.